Sclerotherapy is used to treat spider veins and telangiectasias. Chemical Peels are used to treat acne, sun damage, and increased pigmentation of the skin. Procedures are performed at the office, generally during a 20 minute visit. 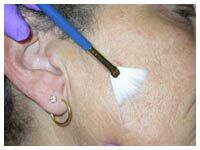 Chemical Peel patients can return to all of their usual activities and cosmetic uses immediately after the procedure. Sclerotherapy patients have minimal restrictions for a few days after the procedure.